Thailand's ruling junta took an unexpected lead in the country's first election since a 2014 coup with more than 90 per cent of ballots counted, election authorities said late Sunday, putting it on course to return to power at the expense of the kingdom's pro-democracy camp. The election, which saw an insipid 64 per cent turnout, was held under new laws written by the military to smooth its transformation into a civilian government. 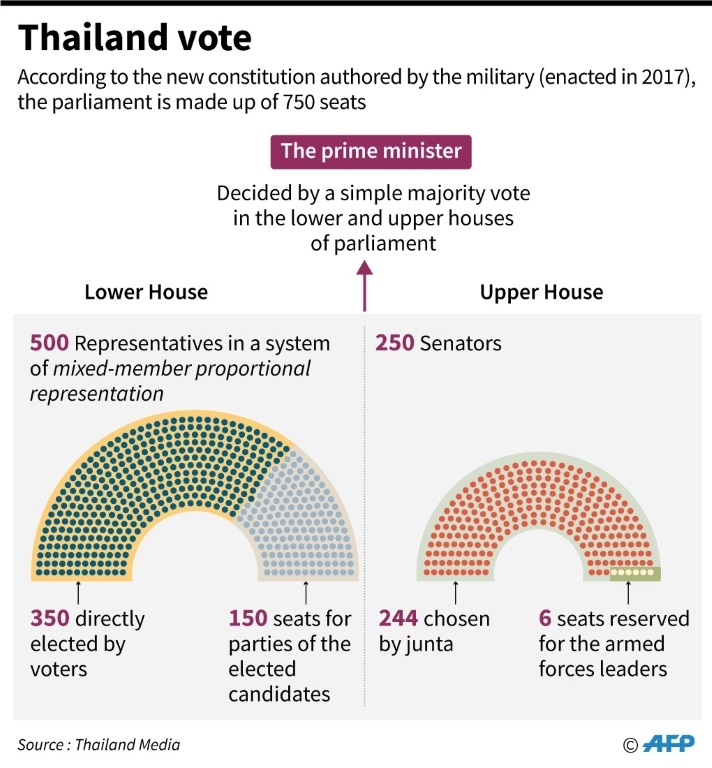 While it had set the rules of the game in its favour, analysts had not expected the party to win the popular vote, given mounting anger at junta rule and the enduring popularity of Pheu Thai, the party of ex-premier Thaksin Shinawatra. But the army-linked Phalang Pracharat party, which wants junta chief Prayut Chan-O-Cha to return as premier, gained more than 7.6 million votes with 93 per cent of ballots tallied, according to the Election Commission. That was nearly half a million more than Pheu Thai, which is adored in the northeast which carries around a third of Thailand's population. "We are pleased with the results so far," said Phalang Pracharat leader Uttama Savanayana. The Election Commission unexpectedly postponed the release of fuller results until Monday, including the numbers of lower house seats won by each party. But questions quickly began to percolate over an election that saw a massive 1.9 million votes invalidated and which many expect to dish up disputes and disqualifications of candidates and parties over the coming days. Dismay rippled out across the pro-democracy camp, whose prospects of squeezing an anti-junta coalition into power appeared to diminish with the Commission's announcement. "This is failure of Thai politics," university student Teetawat Tunpichai, 24, told AFP. "We, the young generation need a better future." The poll pitted a royalist junta and its allies against the election-winning machine of billionaire Thaksin -- who was toppled in a 2006 coup -- and featured an unpredictable wave of millions of first-time voters. But the unofficial tally showed a country cut between support for and opposition to the junta. "Overall the Thai political divide we've had over the last 15 years, is very much there," said Thitinan Pongsudhirak, a political scientist at Bangkok's Chulalongkorn University. "It's very deep, it's structural, it's raw." Fears of the potential for foul play ricocheted across social media as results came in -- a reflection of the lingering mistrust between rival camps, and disbelief that a much-pilloried junta could have won a popularity contest against Pheu Thai. "This election is not normal," Pheu Thai party leader Viroj Pao-In told reporters. "The use of the state power and the use of money -- they (the junta) used it a lot in this election." It reiterated comments by late king Bhumibol Adulyadej from 1969 calling for voters to "support good people to govern the society and control the bad people". Another royal command in February torpedoed the candidacy of the king's elder sister Princess Ubolratana for prime minister via a party linked to Thaksin. That party was dissolved earlier this month following a complaint by the Election Commission, hollowing out the Shinawatras' electoral strategy just weeks before the vote. Thaksin has lived in self-exile since 2008, but he loomed large over Sunday's election. The magic number in this election is 376 -- the threshold required for a parliamentary majority. A junta-appointed senate of 250 will help pick the next prime minister. If the early results play out on Monday, Phalang Pracharat will easily pass the 126 lower house seats it needs to secure an overall parliamentary majority. Pheu Thai needs 376 lower-house seats -- alone or with allies -- to command an overall majority. That now looks distant. That would make them Thailand's third biggest party and a new unknown political force popular with millennials.